Want a new game you can play in any weather? Well then, try Bloons Tower Defense 4. It's difficult to understand the motives behind the monkeys being so intent on destroying the balloons. Researching the subject yields no useful result, in fact there doesn't appear to be any evidence of monkeys interacting with balloons at all, let alone declaring war on them and attempting to eradicate them entirely. I can understand a monkey being antagonised to the point it could pick something up and throw it and that thing could conceivably be a dart, but pushed far enough to drive it to learn how to become a competent sailor, operate complex machinery or pilot a stealth jet aircraft? What on earth did balloons do to these monkeys? What can you really do to annoy a monkey anyway? Pinch his fruit? Can't see how a balloon could pull that off. Refuse to be affronted when he throws faeces at you? Hmm. Suppose a balloon could do that and I can see how the situation might escalate. A stray balloon drifts in to the monkey's field of vision. Purely from an innocent, anarchic sense of fun and with no consideration of consequences, the monkey hurls a wad of faeces at the hapless balloon. The balloon fails to react. Out of grim fascination and mild irritation the monkey hurls a second fusillade of excrement. A breeze blows the unwitting balloon closer. The monkey misconstrues this move as an act of direct, belligerent aggression, so he weaponizes his third salvo by poking in a sharp stone payload. He watches with glee as the tattered remains of his dirigible tormentor flutter to the ground. The next morning he wakes to find a black monolith next to his tree. He wonders what he will do the next time one of these unshakeable, benevolent orbs provokes him so cruelly. Let them come... he'll be ready. I'm pretty confident now that is what happened. In fact, although there is no supporting evidence, I should probably go ahead and post this conjecture as fact in a Wikipedia article. Perhaps I should just get it ratified by the folks over at the David Icke cryptozoology forum first, those guys can spot flim-flam from a mile away. 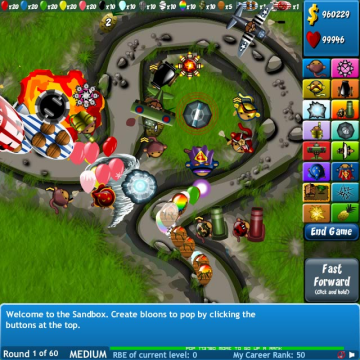 Well Bloons Tower Defense 4 does not only have a history that is colourful and interesting, it has gameplay to match. It's a pretty solid tower defense game that scores over competitors with some great features. One of the towers you'll want to save up for early is a turret called 'The Dartling Gun'. One of the things that can ruin a perfectly good gaming experience is failure conditions beyond your control. It happens when you play STALKER and it's so dark you can't see your enemies, yet every one of the poorly equipped bandits you're fighting appears to be Dead-Eye Duck with night vision and heat seeking bullets. Lara Croft plummets to her death inches from the next auto-save point because the camera went into freak-out mode and decided to showcase the hard work done by the texture artists by focusing on a blank wall at the crucial moment. Likewise it's maddening in tower defense games when you lose lives or hit points because your turrets don't seem to prioritise targets properly and enemies slip through. Well that is not the case here, you have a long range gun at your disposal that always shoots towards the mouse pointer. If a creep gets' through your defense net you only have yourself to blame. A whole layer of frustration is immediately removed. Yeah, you'll be angry at yourself, but that's easier to reconcile than having victory snatched away by some faceless gunner that refused to shoot. "There are no life-signs aboard that pod." I don't care! Just shoot! A) we're living in a world full to the brim with droids that wouldn't show up on your precious little scan and b) We're looking for data not a person, corporal Numbskull! If Vader had a dartling gun the rebellion would have been screwed. But no, he spent all his money on a sword that lit up and with which he failed to do anything particularly significant, other than assure his own downfall. Money well spent. The dartling gun is a gem amongst its genre, but Bloons Tower Defense 4 also boasts persistent character levelling with both unit and upgrade unlocks as a reward. Each unit type has 4 upgrades, the final one being typically very expensive and equally as powerful or beneficial. Go ahead and play Bloons TD4, see if you can help the monkeys finally defeat those accursed balloons.